A few dozen Xavier High School students spilled onto the court and celebrated a 64-48 victory over the Linn-Mar Lions Friday night, but those happy students did not know the entire story. 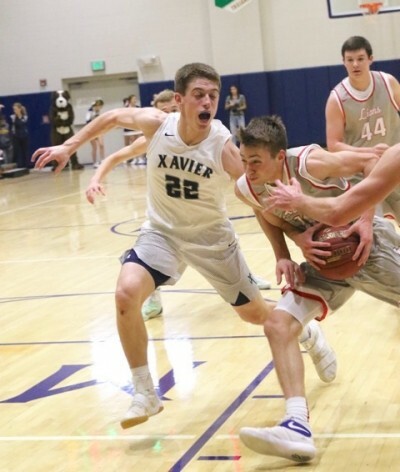 As it turns out, the 16-point victory over Linn-Mar is the biggest for the Xavier boys basketball program in the 36-game history between the two Metro schools. The Saints topped the Lions by 10 points two years ago, but otherwise Linn-Mar has dominated the series since they began playing in the 1998-99 campaign when Xavier High School opened for business. Linn-Mar won the first 29 meetings, many of them by lopsided margins, but the Saints have a 4-4 record against the Lions in the past four seasons and are fighting back. All told, Linn-Mar leads the series 32-4. Linn-Mar is experiencing a rare "down" year for boys basketball with a 7-11 overall record, but they still have talented players and have posted some good victories this season. Xavier Coach Ryan Luehrsmann was happy with his club's performance on Hall of Fame Night at Ron Thillen Gymnasium. "I thought we were very good in stretches," he said. "We shared the ball very well on the offensive end and for the most part were decent on defense. "I still think we have room for improvement, and that's the exciting part," he said. "We're showing signs of life, so that's encouraging." The Saints have won five of their last six games, raising their record to 9-10 with two games left in the regular season next week. Xavier showed good patience on offense, found the open man and took high-percentage shots. They hit 53 percent overall from the floor and were 52 percent on 3-pointers, nailing 9 of 17 from distance. The Saints collected 19 assists on 22 baskets, an extremely high ratio and a testament to the good ball movement. "We wanted this game bad after they beat us the first time," said senior Nolan Butkowski, who played a strong game with 15 points, six assists, five rebounds and three 3-pointers. "We knew what we had to do coming out and we wanted this game. "Coach got us prepared and we were ready to go." The Saints led the 32-minute game from start to finish, with very few lapses along the way. Butkowski nailed a pair of 3-pointers in the span of just a few seconds, turning a 35-29 lead into a 41-29 advantage with about three minutes left in the third quarter. "Nolan stepped up," said Luehrsmann. "I'm really happy with him. As a senior, he knows he's only got so many games left. He's got to take advantage of them and have no regrets. "I like how he's playing," the coach said. "He's real confident. He's shooting when he's open and that's what we need him to do." Sophomore Quinn Schulte scored seven straight points for the Saints with a flurry to begin the fourth quarter, making it a 17-point bulge at 54-37. It became a 20-point game at 62-42 on a three-point play by Max Techau with 71 seconds to go. Matt Mims scored 10 points for the Saints, all in the first half, and finished with a game-high nine assists. "That's what we need him to do," said Luehrsmann. "Just make the right decision out there. There are nights where we'll need him to score 20, and there will be nights when we need him to get 10 assists and get everybody involved. "Matt's a true point guard," he said. "He's not one of those guys who's just looking to go out there and put up points. He's trying to run a team, he's trying to play winning basketball. And I'm happy that he's figured it out at the right time." Jackson Joens popped in a trio of 3-pointers and scored 13 points for Xavier. Techau finished with 14 points and Quinn Schulte had nine points. "Everybody played well," said Butkowski. "Let's keep doing that down the stretch. We can still get better, but I think we're peaking at the right time." Tyler Voves led Linn-Mar with 13 points. Trey Hutcheson finished with 12 points for the Lions. LINN-MAR (48): Phillips 4 0-0 9, Robertson 0 0-0 0, Hand 1 0-0 3, Voves 5 2-5 13, Martin 0 1-2 1, Ruff 3 0-0 7, Hutcheson 4 4-4 12, McGaffe 0 1-2 1, Pistulka 0 0-0 0, Gertsen 0 0-0 0, Kerr 1 0-0 2, Annis 0 0-0 0. Totals 18 8-13 48. XAVIER (64): Keating 0 0-0 0, Ropp 0 0-0 0, Lux 0 0-0 0, Mims 4 0-0 10, Butkowski 5 2-2 15, Van Berkum 0 0-0 0, Joens 5 0-0 13, Dempewolf 0 2-2 2, Q.Schulte 4 0-0 9, Hines 0 0-0 0, Techau 4 6-9 14, Johnson 0 0-0 0, B.Schulte 0 1-2 1. Totals 22 11-15 64. Halftime - Xavier 26, Linn-Mar 20. 3-point goals - Linn-Mar 4 (Phillips 1, Hand 1, Voves 1, Ruff 1), Xavier 9 (Butkowski 3, Joens 3, Mims 2, Q.Schulte 1).